Chocolate has been considered a special gift for centuries. It became linked to Valentine's Day in the 1800s. Heart-shaped boxes filled with decadent treats are coveted gifts on Valentine's Day. Chocolate lovers typically have a favorite type of chocolate, whether it's creamy filled truffles or chocolate pieces with fruit or nut fillings. The tradition of gifting chocolate is anything but new. Chocolate and other sweet treats have been offered for centuries as prized gifts. Even ancient Aztecs and Mayans celebrated chocolate and saw it as a hot commodity. Drinks made of cacao beans would be given as presents to people of high status. Chocolate also would be offered to the gods as a token of appreciation. Cacao beans were even used as a form of currency at one point. During the 17th century, chocolate consumption grew considerably across Europe. Chocolate houses cropped up in London, and the French elite often indulged in chocolate. 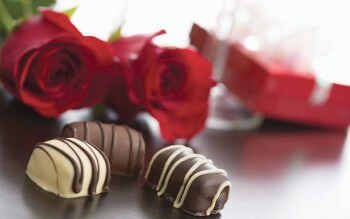 Chocolate's popularity continued to grow, but the dessert was not linked to Valentine's Day until nearly 200 years later. In the mid-1800s, an enterprising individual named Richard Cadbury was looking for a way to make chocolate even more popular than it already was. He sought out a method to make drinking chocolate more palatable and created "eating chocolates." These chocolates were packaged in decorative boxes. Eventually, Cadbury saw the benefit of putting images of cupids and roses on the boxes. Cadbury even designed chocolate boxes in the shape of hearts that could be saved as mementos. These chocolates soon became intertwined with Valentine's Day celebrations. On the other side of the Atlantic, Milton Hershey dabbled in commercializing chocolate as well. Hershey began as a caramel maker, but experimented with covering the caramels in chocolate in 1894. Hershey would go on to develop one of the most successful brands of chocolate in the United States, which included the famous Hershey bar. In 1907, Hershey launched production of tear-drop shaped "kisses." (The chocolates were given their unusual name because of the "smooching" noise made by the chocolate when being manufactured.) The kisses became wildly popular and made for affordable chocolate gifts on Valentine's Day. Many other chocolate manufacturers soon began packaging their chocolates in special boxes for Valentine's Day. Russell Stover and Whitmans are two such manufacturers who have long specialized in heart-shaped boxes or other decorative Valentine's gifts. Traditionally, men have gifted women with boxes of chocolate for Valentine's Day. However, that role is reversed in other areas of the world. For example, in Japan, women give gifts — namely chocolates — to the men in their lives to express love, courtesy or social obligation. This tradition first began in 1936 when confectioner Morozoff Ltd. ran the first ever Valentine's Day ad in Japan through a local English newspaper. By the 1950s, other Japanese confectioners were following suit. Chocolate has long been tied to Valentine's Day gifting. Whether one believes that chocolate symbolizes heightened status, acts as an aphrodisiac or is just a special treat, chocolates will likely always be associated with the day of love.